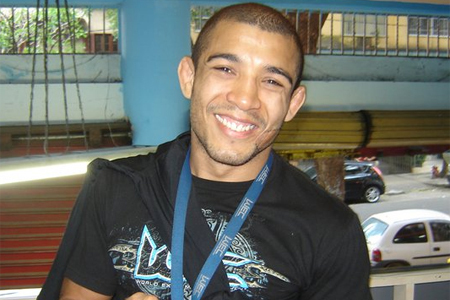 UFC featherweight champ Jose Aldo (Pictured) is the epitome of a rags to riches story. Although the 25-year-old has emerged as one of MMA’s biggest superstars, the Brazilian has never forgotten about the slums from where he once came. Following his unanimous decision victory over Kenny Florian at UFC 136, Aldo has once again teamed up with Nova Uniao to raise money for the kids in his financially-plagued community. Aldo will be auctioning off two autographed items on eBay to help purchase equipment, gis and mats for the Nova Uniao Community Program. The first item up for bid is Aldo’s official UFC 136 fight banner (4′x6′). This is the real deal that hung behind him inside the Octagon on October 8th, not a replica. The second piece available for auction is a signed Team Nova Uniao T-Shirt. ALL of the proceeds will be donated to the Nova Uniao Community Programs in Brazil. The non-profit organization is focused on teaching jiu jitsu to underprivileged youth living in low-income housing developments situated on the hills of Rio de Janeiro. Through this program, aspiring fighters will have the opportunity to stay out of trouble and follow in Aldo’s footsteps.